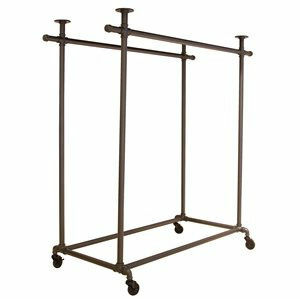 4-Way Clothing Rack, Grey, Adjustable 48" - 72"
Dimensions: 48" x 24" x 52"
Dimensions: 42-1/2" x 23-5/8" x 44"-72"
Dimensions: 21" x 21" x 44"-72"
Adjustable Clothing Rack, Grey, 48" x 22"
Dimensions: 49-5/8" x 23-1/4" x 45"-78"
Dimensions: 51" x 23-5/8" x 64"
The stylish Pipeline Collection includes these unique garment racks that can be a beautiful complement to your existing garment displays. 428901 - Adjusts from 44" - 72" in height. Base: 21"W x 21"D with 13" Faceouts. Constructed of heavy duty 1 1/4" diameter plumbing pipe in anthracite grey finish. Includes four 2" casters, 2 locking, 2 non-locking. 428902 - 64" in height. Base: 51"W x 23-5/8"D. Constructed of heavy duty 1 1/4" diameter plumbing pipe in anthracite grey finish. Includes four 2" casters, 2 locking, 2 non-locking. 428903 - 48"W x 24"D x 52"H Frame only. Our wooden top shelf (428904) is sold separately. This frame is ready for you to add your own custom top. Recommended size of tops should be 60"L x 28"W. Constructed of heavy duty 1 1/4" diameter plumbing pipe in anthracite grey finish. Includes four 2" casters, 2 locking, 2 non-locking. 428906 - Top Bar height adjusts from 63" - 78" in height. Lower Bar Height adjusts from 45"-60" in height. Tier step difference measures 18". Base: 49 5/8"W x 23 1/4"D. Constructed of heavy duty 1 1/4" diameter plumbing pipe in anthracite grey finish. Includes four 2" casters, 2 locking, 2 non-locking. 428905 - Adjusts from 44" - 72" in height. Base: 42-1/2"W x 23-5/8"D. Constructed of heavy duty 1 1/4" diameter plumbing pipe in anthracite grey finish. Includes four 2" casters, 2 locking, 2 non-locking.